And that Theory is The Atmospheric Greenhouse Effect Theory. I recently came across a proposed experiment by Roy Spencer, by which he thought the Atmospheric Greenhouse Effect Theory might be tested. I am a bit doubtful myself whether it would prove anything. I might discuss next weekend. Peter C, heat transfer is an engineering subject which is not understood by so-called climate scientists. Physics is an amalgamation of engineering subjects (eg electricity) for high school children.Engineers think, measure, design and make things of use. Scientists try to think but often achieve nothing worthwhile. I wouldn’t entirely denigrate true scientific effort, as often they come up with breakthroughs that aren’t accomplished by engineering design folks. I seem to recall a discussion somewhere that listed some of our major breakthroughs and whether they were from engineering or scientists. A very long time ago when I was in boarding school, at night there was a radio program telling of accidental discoveries. One story I have never forgotten, though I don’t know its integrity, was of an engineer combining the science of Archimedes Screw and Newton’s laws of motion to propel steam powered ships. When they went to demonstrate their working model their mechanism broke, leaving them with just a remnant of the screw. Faced with the ignominy of having to be towed back to port and do their dough, they tried applying power to see if they could get home under their own steam. To the amazement of all, the remnant screw performed better than the original design. That sounds like the invention of the propellor. Fact or fiction I know not. This could prove it has an effect but would it show if other effects exist and are stronger, have the opposite sign, oppose change or work to produce roll on effects? I don’t think the differences between what engineers and scientists learn is that great except perhaps that engineering has a tighter grasp on reality in that it needs to produce things that work. Work in extremes, for a long duration and as per predictions so often requires a broader knowledge. As well as the specific expertise. I have liked David’s approach with the notch right from the start. Not just because it is similar to the engineering methods I have been taught (at a lower level and then let go rusty) but because it is not attempting to prove a theory but find limits within any working theory must fit and patterns to which it must conform. The CO2 theories just don’t explain things like the Dalton minimum mentioned in the video. It is clear from the record that the sun began to change BEFORE volcanoes popped etc. The Global Mean Annual near-surface Temperature (GMAT) of a planetary body is an expression of the available kinetic energy in the climate system and a critical parameter determining planet’s habitability. Our method is based on Dimensional Analysis (DA) of observed data from the Solar System. DA provides an objective technique for constructing relevant state and forcing variables while ensuring dimensional homogeneity of the final model. Although widely utilized in other areas of physical science to derive models from empirical data, DA is a rarely employed analytic tool in astronomy and planetary science. Our analysis revealed that GMATs of rocky planets can accurately be predicted over a broad range of atmospheric conditions and radiative regimes only using two forcing variables: top-of-the-atmosphere solar irradiance and total surface atmospheric pressure. The new model displays characteristics of an emergent macro-level thermodynamic relationship heretofore unbeknown to science that deserves further investigation and possibly a theoretical interpretation. Engineers have used dimensional analysis since about 1900. There is a section on it in Perry’s Chemical Engineering Handbook. There are many dimensionless numbers used in Heat and mass transfer eg the Nusselt number Nu, the Prandtl number Pr, the Reynolds number Re, The Schnmidt number Sc (which Dr Gavan Schmidt of NASA-GISS admitted he did not know of its use) etc. Those who are not engineers may have heard of the Mach Number -the ratio of velocity to the velocity of sound. This is used in designing gas burners where entrainment can be modeled. I will try to out my summary of Greenhouse experimental data up on the Weekend Unthreaded. I may need to eat my words above. Just found a lot of volcanoes popping off in Iceland in the century before the Dalton minimum. Also found clues to the volcanic activity occurring in longer period cycles that relate to the solar cycle. Too much stuff to link to all of it but here is some. What happened according to wiki in 1783 from the Laki eruption in Iceland. “It has been estimated that 23,000 British people died from the poisoning. 4 different longer period solar effects on volcanic activity. Some of those periods fairly easy to see from this Iceland list. Interesting article Siliggy. Can not think what fool would give a red thumb for your post. Probably they did not bother to read the links. evah about the science… Silly. As the eldest girl in a Catholic family of 10, I have always been a sceptic abou virgin birth, priests, bishops, popes, confession, plenary indulgences, and, of course man-made climate change. You just can’t fall for any of that junk..
Why is the Great Barrier Reef supposedly dying from coal, and Ningaloo isn’t from iron ore, of the reefs around PNG and Indonesia and the Philippines from warm water? Nobody asks or answers these questions because there’s no money in it. a family of 10 ! catastrophe that will never come ! change since 1850 has hurt anyone. – claiming that our planet’s staff of life, CO2, is “pollution” ! and steal their space ship. What a HUGE waste of taxpayers’ money ! To be clear long range models and evidence often contradict each other for one simple reason, models and the data used for input are incomplete. When models in any field do agree with the evidence it’s usually by pure chance and only temporary. For a long range model to replicate reality and hence align with the observational evidence, the models have to take into account so many factors and inputs it would take the fastest supercomputer in the world years if not centuries to compute. Perhaps one day we will build computers fast enough to churn through all the complex theory and data but it’s not here and now. Of course the outcome of the model will still be wrong if any one of a large number of variables is altered by some unforeseen event. In conclusion, long range models are typically worthless. David talks about models and data. I think he is in agreement with the “Physics” of the Atmospheric Greenhouse Theory. Some of that is well established. It is the extension of the established physics to new fields and applications that I take issue with. So far the models are not working. Is the data wrong or are the “assumptions” about black body absorption wrong? Or something else such as the assumption that averaging of temperatures before applying the Stephan Boltzman equation gives the same answer as applying the S-B equation to all the Earths temperatures and then integrating the result? Yes, Extrapolation is what has been going on here, and it is excused as as Physics! Your first paragraph above is the answer. A small redundant part of the heat transfer system of the atmosphere has been given an importance way beyond reality. As Bobl recently showed with an interesting workup of the thermodynamics of the atmospheric Water cycle, there are a lot of problems in assuming that CO2 can control atmospheric temperatures. I remember reading somewhere that the GCMs assume far too many “partials” are fixed values, but a lot of these partials seem to vary chaotically. One example is Ohms Law, where as long as the resistance and voltage source are constant values, then the current can be calculated. So the voltage and resistance values could be assumed to be a partial. But in reality, often the voltage and resistance vary due to a wide range of possibilities, therefore any current calculation would be wrong. I believe that the GCMs make far too many assumptions, and the cumulative effects of all these assumptions varying destroy the model results. The GCMs show that as CO2 increases the global mean temperature increases – I would not call that a “worthless” result. The model projections I have seen match observations pretty well, when you allow for natural variability. Only a couple of problems with your theory [snip], ice core samples show Co2 lagging temp and world temps are not going up even though Co2 supposedly is . Models can’t explain why in the past we have had high Co2 while at the same time an ice age but no doubt you will have an excuse . Is insults the best you can do? I thought this was a discussion of the climate science. CO2 is going up and global mean temperatures are going up. I don’t see any “lag” myself. David Evans himself says in the video that the temperature observations are pretty good, and the observations should be trusted over any modeling. Perhaps some people think the climate models are a type of magic; they are not of course but they do provide useful projections. 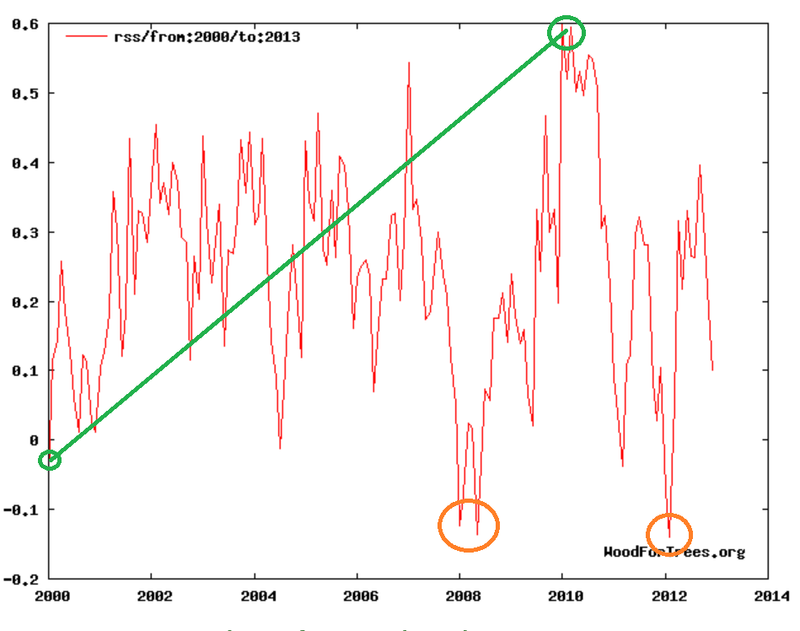 Even if there were no models, AGW still stands unfalsified because of the other lines of evidence which supports it. He was talking about satellite data NOT the surface garbage. And that satellite data shows NO WARMING apart from the El Nino step in 1998 and the 2015/16 El Nino transient, now decayed. Your LIES are getting more and ore desperate. Do you have any empirical evidence of CO2 warming? In what way has the climate changed in the last 40 years that can be SCIENTIFICALLY proven to be caused by atmospheric CO2? They provide just the projections the alarmist want them to provide. But they still MISS reality by a mile. ! You of course fall for them “resetting” the zero point every few years to make them look better.., but even after all that, and after all the data “adjustment™” and fabrication (nearly half of the surface data is just made-up) they STILL can’t get near the temperatures “projected™” but the wacky climate models. Many skeptics say models of hypothesized forcing are enough for to claim CO2 change equate to 100% OHC (Ocean Heat Content) change. For them real-world measurements are not required. Further these cAGW advocates say that anyone skeptical enough to insists on having them is just engaging in game-play by questioning “the laws of physics”. However the true skeptic would counter with: The laws of physics are NOT in question but their correct application, the quality of the judgement made of them. Real scientists wish to see real-world observation of cause-effect tally with the modeled assumptions. Currently cAGW advocates do not have that, so surely if this question is left unanswered how can it ever be known that the physics is misapplied or not? How much (quantified) change in water temperature is caused (by any method) by an fractional increase in atmospheric CO2 concentration by 0.00006? Is it 0.00000001K? 0.000002K? 0.0003K? What is the value? Currently it is not known? And THAT IS a problem. Because in science it is not correct to say everything is taken care of even if there are no measurements, because through models we know (or more likely variably estimate it) anyway. And that’s exactly what cAGW advocates are doingwith the models! Yes heat imbalance can be observed, but only with vast uncertainty values that overwhelm in more than an order of magnitude greater than the assumed imbalanced value itself! During 2000-2010, the radiative imbalance was apparently “observed” to be +0.6 W m-2, and the uncertainty for this value? +/-17 W m-2! So the radiative imbalance ranged anywhere from -16.4 W m-2 to +16.4 W m-2. I wonder what it really is? And the cAGW advocates would like to claim that this (effectively unknown imbalance), which could be as low as -16.4 W m-2, is understood (and for the given the uncertainty) has been observed, thus, for the cAGW advocate, it is therefore known that CO2 caused it! That is a nonsense of course. The cAGW adherants are very anti-skepticism. For even with those error bars and that level of uncertainty, how could it be anything but an assumption to judge what the radiative imbalance is, and to assign it to the CO2 concentration change as the cause? 1) there is a radiative imbalance from the increase of the CO2 concentration. 2) this causes the heat content to increase. This truly is not reasoning! These are merely assumptions based on results from unreal-world computer modeling. The uncertainty of radiative imbalance range up or down by up to 34 W m-2. The radiative forcing attributed to the CO2 level change (From the above paper it’s around 0.2 W m-2 from the +22 ppm CO2 during 2000-2010) is 2 orders of magnitude smaller than the uncertainty range. So how can anyone claim that these models are a calculations from basic physics, claim that it is CO2 forcing when the alleged CO2 forcing is no more than chaotic noise in the climate system? Real-world evidence is needed. Observations, not modeled assumptions, are needed. Why can not cAGW advocate be more skeptical about what they believe to be true? Is the religious ferver too great to question, or to reason logically? This statement of fact supports the hypothesis that rising temperatures cause rising atmospheric CO2. This hypothesis is supported by all the evidence to date and is effective on time scales from hours to millennia. There is NO empirical evidence that supports the reverse hypothesis that is the center of the controversy described by Dr. Evans. What is your evidence for your claim that rises in temperature are preceding rises in CO2 concentration? You are fibbing when you say there is “no empirical evidence” for CO2 preceding rises in temperature. I can think of at least 4 lines of evidence: 1) carbon accounting for fossil fuels burnt 2) isotope analysis shows the CO2 is from old carbon ie mined fossil fuels 3) the amount of oxygen in the atmosphere is declining in line with carbon being burnt. 4) the rises started with the onset of the Industrial Revolution. It’s not a controversy at all. The majority of climate scientists agree with the evidence that increases in CO2 are causing global warming. Carbon accounting ?? Oh so you’re saying 96% of Co2 is from fossil fuel and 4% is from natural sources ? My my I certainly had that one wrong . No, the warming started at the end of the LIA anomaly. It is NATURAL and is the cause of the highly beneficial rise in atmospheric CO2. Humans have been minor contributors at most. Peer reviewed papers saying some 10-15% of that highly beneficial rise of atmospheric plant food that is GREENING the planet, waking the carbon cycle back up from its barely sustainable lethargy, and helping the world feed its ever increasing population. What your observed verified evidence for atmospheric CO2 level warming up the atmosphere and causing changes in the climate? Why was the Holocene Thermal Maximum global temperature 2.0-3.0 C warmer than now…since CO2 was 260 ppm back then? Why has it cooled as CO2 has risen? What caused the cooling, since it wasn’t CO2? And.during the Ordovician, CO2 was 4,500 ppm…and the Earth was encased in ice. Why, Harry, why? AGW still stands unfalsified because of the other lines of evidence which supports it. Read this model of atmospheric `warming’ which is far more accurate than any of the IPCC etc Climate Models. It’s all natural and if its factors vary, the temperature varies. CO2: it’s just a gas as are methane and CFCs. When you are so obviously wrong and it’s pointed out to you over and over I can’t see a way to call it a discussion. It’s you trying to badger the rest of us into accepting your position. I would think that you would get as tired of that as I am of reading it. I only see you commenting when the subject is something as important and as convincing as this interview with Dr. Evans. Are you afraid he’ll convince someone that he’s got it right? If you were any kind of scientist at all you would welcome his point of view and be able to do a much better job of trying to counter it. But you can’t do that, can you? All you have is taking points. Ha ha ha David Evans is NOT a climate scientist, so why would I be in the slightest bit interested in what he says. Just another fake expert on a dodgy CT youtube channel looking for donations, there are heaps. Ha ha ha David Evans is NOT a climate scientist, so why would I be in the slightest bit interested in what he says. I have no idea Harry. You picked this thread to comment all over so maybe you can tell us. No one forced you to say a single word. In the meantime laughing at a man many times your better in just the skills it takes to do climate modeling shows us just how immature you are. The nest big breakthrough in climate science will have astronomical implications and the names of Scafetta, Wilson and Evans will be writ large. We disagree on your first point, Twinotter. You most certainly aren’t. So what are your academic qualifications to be able to deny Dr Evans ones? Where is your Stanford University PhD? Your Masters degrees? What was your undergraduate degree(s) in? Do you even have an undergraduate degree? Compared with Dr Evans, Harry, you are a mere Space Cadet. For your second point, you ask “why would I be in the slightest bit interested in what he says. Then why are you here? Your presence says otherwise, it says you are very interested and through that presence you’re proving yourself to everyone to be a dissembling sophist. DE knows more about climate science and CO2 than basically anyone on the AGW payroll. Certainly his knowledge is FAR greater than ANYTHING you will EVER know about ANYTHING. You are yet again PROVING just how deep your childish IGNORANCE really is. So funny watching you do everything you can to avoid actually producing any evidence for warming by atmospheric CO2. Because like most adherents of the church of cAGW you come here to protect what you feel is the domain of the high priests of Climate Seances. You probably feel upset that a mere Mathematician with many academic degrees and first hand knowledge of how ‘carbon trading’ works, may reveal that your BELIEF in Global Warming is nothing but that — a belief, and has little in the way of real presence. Indeed you display all the fervor of a religious adherent shouting at the heretics, trying to awaken the slightest spiritual feeling among the non-believers. I’ll stay silent about that comment. Others will make their own judgments without my help. And by the way, the fact that you are here commenting tells everyone that you care about what Dr. David Evens says. Perhaps you could boost your standing on Jo Nova by listing your degrees for everyone. How about it, Harry, show us you’re not a fraud — or is it afraid?. At least you’ve said something we can’t disprove. A Space Cadet, though, you most definitely are, and a genuine one at that. Well yes twotter.. YOU REALLY ARE. You pretend to have scientific knowledge, but are totally unable to back up anything you say with any science. That makes you a FR**D !! Was a typo ,should have been an O not an A . Did you give me a red thumb? If so can you explain why? You are TOTALLY UNABLE to produce any. You have NOTHING but yap. !! Even the fabricated and adjusted GISS garbage barely touched the RCP4.5 level at the peak of the El Nino. They are pathetically USELESS. With the coming cooling, the models will become even more of a FARCE. 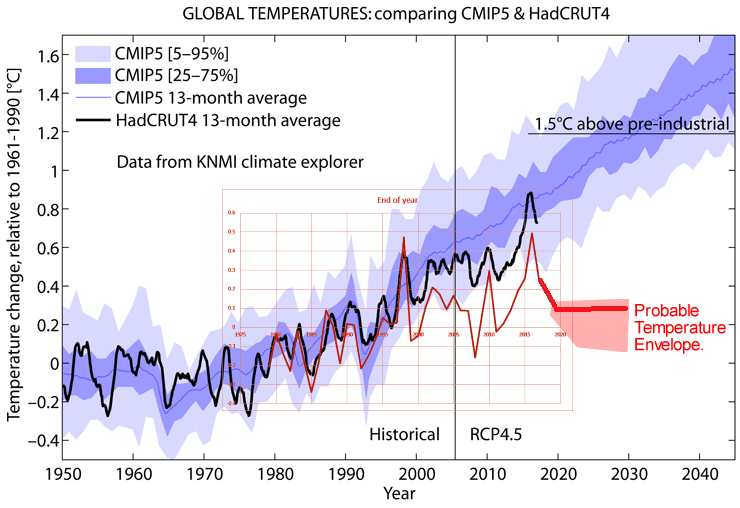 Current temperature tracks Hansen’s “basically no new emissions” scenario rather than the model scenarios that are near RCP8.5 with China’s, India’s etc rapidly increasing release of atmospheric plant food. There is NO DIRECT EVIDENCE of atmospheric CO2 causing warming, ANYWHERE, ANYTIME. All they have is agenda-driven modelling based unproven conjecture. Then they are manifestly WRONG. Just gave you a green thumb for that excellent observation Andy. So the natural variability is all that is needed . Thanks twotter, but we already KNEW that. With thank to Kenneth Richard@NoTricksZone for this information. So what? I do not know of any climate scientists claiming the GCMs are extremely accurate. Actually the projections show some quite large confidence bands. It’s all in the IPCC AR5 report if you want to look it up. NO. climate models show HUGE EROOR BANDS. Make them wide enough.. but STILL miss the side of the barn. They are basically USELESS for any purpose except MINDLESS AGW propaganda. Which is why twotter is so enamoured of them. It is his life. The way I see it, the scientist who take verified measurements have the reality of observations with error bars – real objective measurements. The computational climate modelers have ‘confidence levels’ of their virtual reality climate model – subjective ‘feelings’ about an IMAGINED outcomes. Measured results are far more believable as they can be verified, those confidence levels are at the behest of computer models that have been tweaked, tuned and fudged to give the results the cAGW rabble high priests wish. Harry as has been reported quite a few times the confidence levels expressed (and even more so in the Summary For Policy Makers) have little or no absolute meaning. Confidence level is just a statement of faith not substance. They may as well be asked how much of the reports do they believe, confidence, faith, and belief are not needed in science — what is needed is real verified observations. Its quite hilarious from a scientific point of view. The further their models get away from reality.. the more confident in them they seem to get. Its a weird branch of non-science , that is for sure. Judith Curry is WELL RESPECTED because she actually looks at the REAL science, something the likes of you and the climate scammers you worship will NEVER do. It is the self-proclaimed climate scientists that are the complete and utter REJECTS from the world of rational thought. You have ZERO science to back up anything you say. You are an empty sack. Why are you being such a COWARDLY little non-entity? Fort CO2 to rise BEFORE the temperatures there would have to be a mechanism that increases CO2! (NOT industrial revolutions at millennia before present) Therefore it has to lag. I see that something got you out of bed today to post more of your patented unsupported drivel, but I notice something what you left out, something that I notice warmist/alarmists like yourself keep forgetting about, the Tropospheric “hot spot”, where is it Harry? it is important because precious AGW based climate models did say it was supposed to be up there and easy to see too. Maybe it was the awesome CO2 molecular invisible powers made it invisible, what do you think, Harry? Well other than your use of insults showing your lack of intellect, I am not worried about the occassional anomaly in any scientific theory, all scientific theories have them. And I daresay you do not even know what the hotspot is or what it signifies. I never attacked you personally, just your scribblings I attacked. I have noticed your sudden concern about insults these days, did you get baptized recently? since I recalled that you were quite the insulter in the good old days when you used to post a lot more often, even with deep disrespect of certain scientists whom you thought were in pay of big oil or some other juvenile attacks you were known for. Then you concede there was never any Tropospheric “hot spot” to find after all, since you didn’t helpfully answer my question about its proposed existence via the modeling construct. That is a relief after all since it was supposed to be a portent of doom, but alas too much wine was spilled in the cramped modeling room. I do know what it is and even know where the satellite data is to show it doesn’t exist, but that would be zooming way over your head, which is why I didn’t dive into the details, after all I don’t want to be blamed for your sudden health problems, after all your lack of intellectual candor is obvious here. You certainly haven’t got a CLUE. Just MINDLESS regurgitation of empty garbage. And you certainly have ZERO EVIDENCE that atmospheric CO2 causes warming. Oh dear Harry you’ve reverted to form with that insult. You do not know what knowledge or qualifications the commenter ‘sunsettommy’ has, so you only display your personal ‘feelings’. Ah, I see that Harry is still flummoxed over a simple question about the “hot spot” that eludes detection outside of modeling constructs. The poor boy easily tripped over a well known modeling failure that is a long running embarrassment to the AGW conjecture, which is why you and most other silly warmist/alarmist try to ignore it as much as possible. It is clear you can’t answer the simple question, which is why you play the boring evasive replies game, which is another example of your unwillingness to get into an honest debate, the evidence is all over this thread, that you have demonstrated no visible skill in making a debate. Was it the lack of coffee or Milk that made you this way, or was it the stupid brain numbing AGW propaganda that made you that way? In any case the Question is still on the table when you reach one of those lucid moments that allows you to answer it, seize the moment I say! Harry reverts to type. He has no idea what sunsettommy is talking about. It hit his (Harry’s) impenetrable ossification layer but not all of it bounced. So he throws out an insult. He only comes here to throw out insults and to belittle others who are far far more knowledgeable than he is. He never answers questions no matter how specific they are or aren’t, yaps for `evidence’ at almost every assertion, yet seldom gives any. He either doesn’t read the supporting links provided for his yaps, or, if he does, doesn’t understand them. His ossification protective layer might be better described as a shell of pure neutronium. Whatever it is, he has shown an amazing inability for, or a great skill at dodging or evading, any form of learning. It would appear that he’s drawn Troll Duty from Troll Central for this week. Maxine was last week … at least `she’ seems to be (superficially) a trier who attempts to stay on topic and is not so Thin Skinned™, managing to remain civil. But she’s not as much fun as Professor de Havilland. That, of course, is true only if they are both real people and not some virtual personalities wielded by a certain troglodyte. It appears that Harry doesn’t know what I AM TALKING about since he never did answer the question about the “hot spot”, maybe it something to do with putting him on the spot that is impossible to answer, after all the red spot doesn’t exist after all. Look on the bright side, the world isn’t doomed after all, thus your evasive handwringing replies was a waste of time, all because you warmists have a serious case of the spots! Go sip a soda on the rocks and relax. Indeed without the tropical upper atmosphere getting anomalously hot the CO2 supposition falls. The theory of CO2 warming utterly relies on it, without it Harry you have nothing, not a fig-leaf to hide behind. Even the IPPC recognize this as a problem! GCMs are reverse engineered. They will show what the modeller expects them to show. Furthermore, if more than one modeller has worked on the model, unless the modellers have been working in close cooperation, nobody will know how the model was written. Input data are too chaotic to ever expect a model’s output to be repeatable. Unless its a hockey schtick. Got any evidence to back up your claim about the GCMs ? Taking the manic troll headless chook evasion route, I see. GCM are based on FANTASY, nothing more, nothing less. of the sun’s effects on warming is career death for scientists. debate and genuine criticism of the science. I was noticing a desire for chocolate as I was listening . . . . . . . The climate scientists have never disputed CO2 can lag temperature increases at the termination of glacials (sometime it does, sometimes it doesn’t). So it’s a straw man argument. But once the CO2 does start to increase, it reinforces the global warming. The actual story of the “lag” is a bit more complicated (it varies depending on which hemisphere is being warmed by the Milankovitch cycle). Is insults the best you can do? I have not seen anyone provide references and evidence in these comments yet. I wish they would, I always check references if given. You are aware that CO2 levels are rising now, and the global mean temperature is rising as well? That sounds like evidence to me. Your turn now, please provide evidence and references to back up your claims. 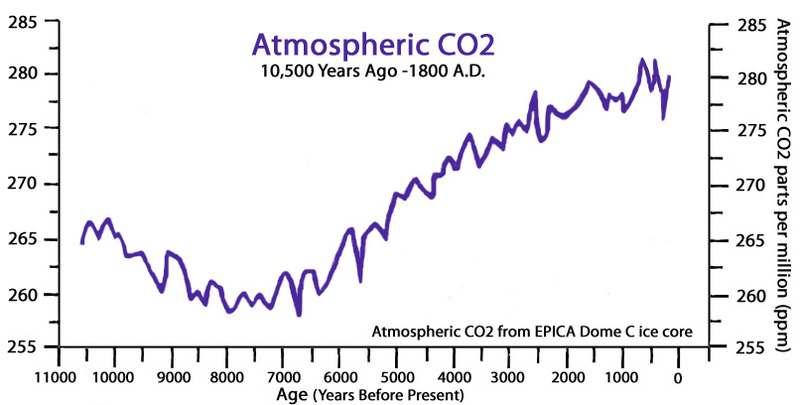 Combined with empirical observations, it proves that CO2 levels follow temperatures. It can be observed in the recent temperature record too: CO2 level variations follow temperature variations. Why did you only use southern hemisphere sea surface data? The forward relation between temperature and CO2 levels exists for all the data sets but is more visible in ocean temperature data. The southern hemisphere contains mostly oceans. Well your chart did not actually show that, it was a dog’s breakfast of noise, I could see temps preceding and lagging CO2. But I gave you a green thumb for actually trying to show some evidence to back up your point, it is rare in this blog. You would be better off looking at the entire globe, just looking at one part is cherry-picking in this context. CO2 lagged temperature increase in some of the glacial terminations, that is not in dispute by climate scientists. But the situation is different now, CO2 is definitely preceding global warming there are multiple lines of evidence for this. Check out Potty’s discussion about the “lag” if you have time. Why would anyone want to check out your potty.. Seriously twotter?????? You have not presented one single bit of evidence. 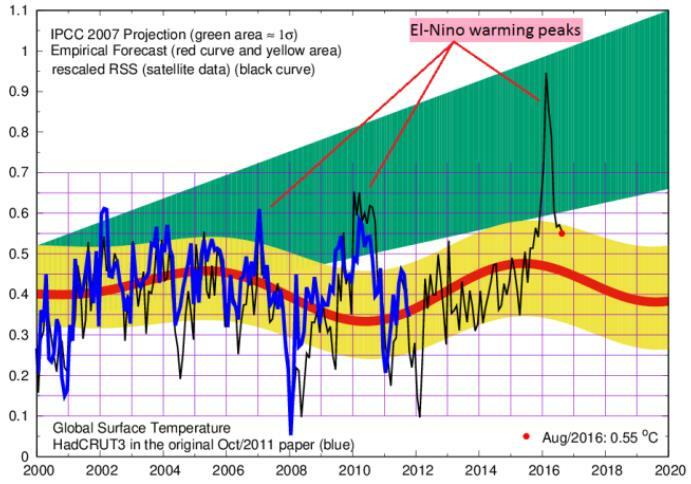 Mindless regurgitation of AGW propaganda pap… is NOT evidence. Evidence of a greener planet. No warming in the last 40 years except from El Nino events. El Ninos CANNOT be caused by atmospheric CO2. There is no empirical evidence that atmospheric CO2 can cause atmospheric warming. I want to back you up on this, but i think we have to be clear., and precise. ..
Its impossible to separate out all ElNino/LaNina effects from recorded available data, as there is some Effect almost every few years. Sure you can spot and delete some obvious ones ’98, 2015/16 etc,..but a fullly purged data set is not available. The slight trend in temperature .(0.1C/decade). is far below any predictions from the Models presented by the IPCC or others, such that they fully discredit those models and the theory they are based on. 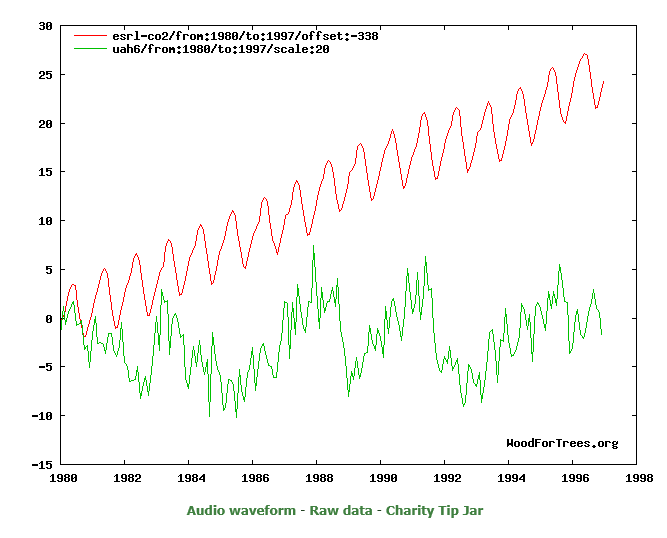 No you are wrong, all the data sets show a strong global warming trend, even the satellite record. I really really cannot understand why this is denied by some, the evidence is so clear. No, the model projections fall within the confidence level envelope. Most of the models show the global mean temperature will increase as CO2 increases. As we keep saying , if you “normalise” the extreme Elnino/Lanina years , then the 25/30 year trend is way below 0.2 Cper decade….depending on the dataset chosen, and how much other “adjustments” have been made to it….it could be a little as 0.8 C/decade. All of that is completely out of range of any IPCC models or predictions. Between those two major events.. THERE IS NO WARMING for 33 out of 40 years of the satellite record. There is ZERO EVIDENCE of atmospheric CO2 causing warming of anything, anywhere, anytime. Of course they do, that is what they were designed to do.. DOH !!! But as I have clearly shown, for 33 out of the last 40 years..
this is manifestly WRONG, with the only warming coming from ocean events that can have NOTHING to do with atmospheric CO2. There is absolutely ZERO CO2 warming signature in the satellite temperature data. Yep, you have been TOTALLY EMPTY of any evidence or anything but yap. Waiting for empirical evidence that atmospheric CO2 causes warming.. I have not yet seen evidence which supports your ‘AGW Green House Theory’ other than the failed models based on CO2 – which can only prove CO2 is not a factor. Other than this you supply rhetoric about AGW that you claim is evidence for drought, no drought, rain, no rain, cold, no cold, snow, no snow. With all the conflicting evidence you say proves AGW Green House Theory – how are we ever to know when your global warming turns the corner – seems to me the same evidence is attributed to Global Warming as to Global Cooling… ? So you are telling you have not seen the evidence, despite the fact I have commented about several lines of evidence. It sounds like you will never believe anything. It’s a bit hard talking about something that is not happening. We will never know when it happens as all your conditions for Global Warming are the same as the conditions for Global Cooling. “The reduction in total cloud cover of 6.8% [between 1984 – 2009] means that 5.4 Wm−2 (6.8% of 79) is no longer being reflected but acts instead as an extra forcing into the atmosphere… To put this [5.4 Wm-2 of solar radiative forcing via cloud cover reduction between 1984-2009] into context, the IPCC Fifth Assessment Report…states that the total anthropogenic radiative forcing for 2011 relative to 1750 is 2.29 Wm−2 for all greenhouse gases and for carbon dioxide alone is 1.68 Wm−2. The increase in radiative forcing caused by the reduction in total cloud cover over 10 years is therefore more than double the IPCC’s estimated radiative forcing for all greenhouse gases and more than three times greater than the forcing by carbon dioxide alone [from 1750 to present]. … According to the energy balance described by Trenberth et al. (2009), the reduction in total cloud cover accounts for the increase in temperature since 1987, leaving little, if any, of the temperature change to be attributed to other forcings. With thanks to Kenneth Richard@NoTicksZone for the info. You have NOT presented ANY empirical evidence. The fact that you seem to think vague correlations in adjusted data are any sort of evidence, says all that needs to be said about your understanding of anything to do with science. You mean actual changes in the climate? No warming except El Ninos in 40 years. All climate measures very much within the natural range. NOTHING happening with climate that can be scientifically proven to be related to human activity. NO EMPIRICAL evidence of warming by atmospheric CO2. How can ocean surface possibly be warming if the precipitable water over them is declining over the last decade. A value of 0.14C is within the error band from zero. According to NOAA, the top 2000m of the world oceans has warmed by just 0.08ºC in the last 60 years. You tell me, you are asking the question. No it isn’t, unless you are ignoring evidence. “Temperature records from central Australia prove it was warmer in the late 19th century than now”. Reference please. And so what, global warming is called global because it averages out temperatures over the entire globe. ” It is well documented that USA had its highest temperature in the 1930s.” Same again, not the globe. There were some temperature spikes in the USA at that time, but when you look at the decadal aerages the 1930s was not the warmest decade in the USA. “The satellite based temperature data has current global temperature 0.14C above the 30 year average 1980 to 2010:” So what? “A value of 0.14C is within the error band from zero.” Huh? It look like you just made that figure up. There is little evidence. This last couple of hundred years are no worse than any other 200 year period! Oh, sorry you cAGW advocate can’t work on that long a time spell can you, for you know that your worthless supposition about CO2 would be destroyed by the evidence. And it is pointless pushing your nose into the real science papers as you can’t read and understand science. Harry as you like it here so much why not read a few more information pages from here. Where are your backups Harry? It works both ways you know. ” I have not seen anyone provide references and evidence in these comments yet. ” That tells us that you haven’t read the comments. No it is Not a Straw Man Argument! It is about Causality. If CO2 leads warming then CO2 can be the cause. If CO2 lags warming then CO2 is the result. You did not read what I said. I said climate scientists do not dispute CO2 levels sometimes lag global mean temperature increases at glacial terminations. It was the climate scientists who actually discovered this fact, and wrote papers about it. When you misrepresent the arguments put forward by the other party it is called a straw man (or sometimes an Aunt Sally), it’s a logical fallacy. Yes I did read you. No it is not a Straw Man, Nor an Aunt Sally (do you you know what that is), nor a logical fallacy. It is an argument about CAUSALITY. I thought Aunt Sally was a type of skittles game…. I played it in Oxford in 2012 at a pub…. 1. a game played in some parts of Britain in which players throw sticks or balls at a wooden dummy. 2. a dummy used in the game of Aunt Sally. 3. a person or thing set up as an easy target for criticism. As a landowning farmer, I have always felt that I was under attack from Marxist elements in “The System”. It seemed to me that kids were taught at school that ever since Adam the landowners have exploited the workers, and nobody ever taught them that in Australia their fathers and grandfathers had sorted that problem out a long time ago. Now two generations further removed. So it’s extremely interesting to see Google in 2018 citing this issue as an example. My fears were well founded. Yes Peter, please read carefully. Just as Global warming sometimes causes droughts and sometimes doesn’t. Sometimes causes floods and sometimes doesn’t. Sometimes cause snow and sometimes doesn’t, etc, etc, etc. Harry, describe a condition under which your AGW Green House Theory can be falsified? Here is a simple question for Harry.. In what way has the climate changed in the last 40 years that can be SCIENTIFICALLY proven to be caused by humans.? Hurricanes etc pretty much normal to low. Normal to lower level of droughts. There is NO human caused climate anything… anywhere..
.. which, while they take up a large part of the fantasy fabrication called the Global Average Surface Temperature, actually take up a very TINY fraction of the Earth’s surface. How to falsify AGW? If the global mean temp trend did not change, or goes down as CO2 concentration in the atmosphere increases. A lack of a correlation would be a falsification. All your failed CO2 Based Global Warming Models falsify the AGW Theory. Thanks twotter, you have just falsified the AGW scam. Perhaps this paper is the close enough to convince you. So you are betting your life on a handful of fake experts and fringe scientists, while disregarding the majority? Does not sound like a safe bet to me. Anyway people are still missing the point: GCMs are only one line of evidence amoungst many lines of evidence for AGW. It is not wise to try and treat individual lines of evidence in isolation, you need to also consider the preponderance of evidence. So produce your evidence Harry. Its so funny watching you worm and squirm in your desperate evasion of actually producing any evidence of warming by atmospheric CO2. I can lead a horse to water, but I cannot make them drink. Try starting with the IPCC AR5 report. Or try the Skeptical Science website, it is easier to read. Or even give Wikipedia a shot. 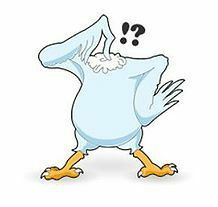 The headless chook routine suits you to a tee. Running around in a mindless DESPERATE attempt to avoid producing any actual evidence of warming by atmospheric CO2. No wonder you are so DEVOID of any actual science. ! 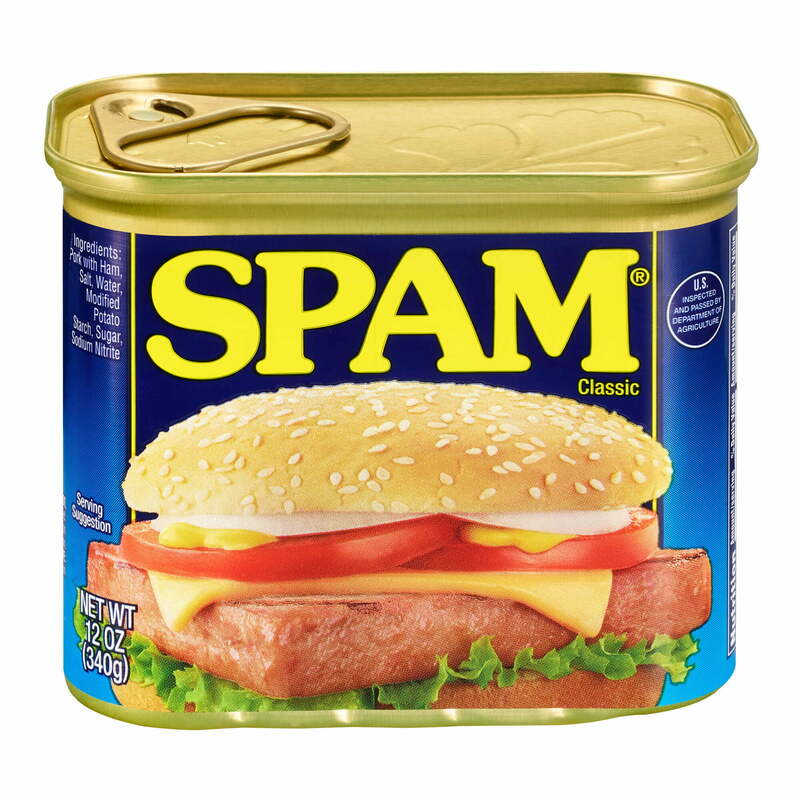 Annie this is Harry’s support team, all the memes worth mentioning. He doesn’t feel obliged to come up with the evidence, but I expect you have answers to all these AGW talking points. I can lead a horse to water, but I cannot make them drink. but I cannot make ‘them’ drink.’ Harry evincing magical properties. Maybe his name hinting at this? … and out of the archived posts Harry returns today to refute natural cycles. What happened, Harry, The Gruniad close your climate pages? James I might answer if I knew what the heck you are talking about. Can’t say I have ever heard any climate scientist saying natural cycles don’t exist. I know you are not a deep thinking, but when you misrepresent what someone says that is a logical fallacy known as a straw man. I just find it difficult to understand how people believe that after 4 billion years of continual natural climate upheavals between extremes of heat, cold and every other combination betwixt the planet warmed slightly from the depths of the the Little Ice Age about 250 years ago and you see this as a man-made disaster. Your IGNORANCE is your only known personal feature. its called EVIDENCE, twotter.. and you DON’T HAVE ANY !! In fact, in the Vostok core, peak CO2 was NEVER able to maintain peak temperature. At peak CO2 , it was always COOLING. The global mean temperature HAS NOT RISEN in 40 years apart from the step change at the 1998 EL Nino and the transient El Nino of 2015/16, neither of which could possibly have been caused by human anything. You have ZERO empirical evidence that atmospheric CO2 causes warming. And a little paper at http://science.sciencemag.org/content/283/5408/1712 has this to say. Air trapped in bubbles in polar ice cores constitutes an archive for the reconstruction of the global carbon cycle and the relation between greenhouse gases and climate in the past. High-resolution records from Antarctic ice cores show that carbon dioxide concentrations increased by 80 to 100 parts per million by volume 600 ± 400 years after the warming of the last three deglaciations. Despite strongly decreasing temperatures, high carbon dioxide concentrations can be sustained for thousands of years during glaciations; the size of this phase lag is probably connected to the duration of the preceding warm period, which controls the change in land ice coverage and the buildup of the terrestrial biosphere. I wonder how that fits into the rise in atmospheric CO2 level causing global warming, or even Hansen’s thermal/climate runaway imaginings? CO2 is a by-product of the solar-warmed ocean, not the cause of ocean warming. The only real complication here is you disbelieving the truth. Nope . NO EVIDENCE from you at all. The actual story of the “lag” is a bit more complicated (it varies depending on which hemisphere is being warmed by the Milankovitch cycles). Milankovitch’s research showed more that one cycle! Milankovitch’s research showed more thatn one cycle! Milankovitch theory describes the collective effects of changes in the Earth’s movements upon its climate, named after Serbian geophysicist and astronomer Milutin Milanković, who worked on it during First World War internment. Milanković mathematically theorized that variations in eccentricity, axial tilt (see https://upload.wikimedia.org/wikipedia/commons/thumb/a/ae/Earth_obliquity_range.svg/545px-Earth_obliquity_range.svg.png), and precession (see https://upload.wikimedia.org/wikipedia/commons/thumb/4/43/Earth_precession.svg/526px-Earth_precession.svg.png) of the Earth’s orbit determined climatic patterns on Earth through orbital forcing. The Earth’s axis completes one full cycle of precession approximately every 26,000 years. At the same time the elliptical orbit rotates more slowly (see https://upload.wikimedia.org/wikipedia/commons/8/89/Precessing_Kepler_orbit_280frames_e0.6_smaller.gif). The combined effect of the two precessions leads to a 21,000-year period between the astronomical seasons and the orbit. In addition, the angle between Earth’s rotational axis and the normal to the plane of its orbit (obliquity) oscillates between 22.1 and 24.5 degrees on a 41,000-year cycle. It is currently 23.44 degrees and decreasing. Other astronomical theories were advanced by Joseph Adhemar, James Croll and others, but verification was difficult due to the absence of reliably dated evidence and doubts as to exactly which periods were important. Not until the advent of deep-ocean cores and a seminal paper by Hays, Imbrie, and Shackleton, “Variations in the Earth’s Orbit: Pacemaker of the Ice Ages”, in Science (1976) did the theory attain its present state. Hays, J. D.; Imbrie, J.; Shackleton, N. J. (1976). “Variations in the Earth’s Orbit: Pacemaker of the Ice Ages”. Science 194 (4270): pages 1121–1132. DOI:10.1126/science.194.4270.1121. and PMID17790893 (http://www.ncbi.nlm.nih.gov/pubmed/17790893). CO2 doesn’t actually cause warming except in laboratory experiments, so where is this positive feedback you talk of? Temperatures have been flat for a generation, even with a couple of large El Nino spikes. My kit is full of negative feedbacks and I would be more than happy to give you the salient points. I don’t have any time for physics deniers. Find yourself a new hobby, and quickly! We have no time for YOU either twotter. You are as ignorant of physics as a termite. DENIAL of physics goes hand in hand with mindless belief in AGW. But that is your chosen path.. wilful ignorance. Playing a harmonica? Harry probably knows. Harry the IPCC alone with many other scientists say you’re wrong …. “[F]rom 130.5 to 129,000 years ago, the rise in atmospheric CO2 concentrations lagged that of Antarctic temperature unequivocally….At mid-slope, there is an unequivocal lead of δ15N [temperature] over CO2 of 900 ± 325 yr”. Go for it – provide references to back up your claim, just one good one will do. I was not aware of any glacial terminations during the MWP, but I am willing to consider the evidence. Its there in the post above.. You are being wilfully ignorant, still. We are still waiting for you to produce some actual evidence for CO2 causing warming. So far , you are just an EMPTY SAD SACK. Just twotter doing multiple hits. ! Probably he’s low on cash. I understand the the ‘Coalition of Concerned cAGW Advocates’ (aka Consensus of Climate Clowns) pay well for sputtering baseless nonsense on Joanne’s blog. And I must say he’s nearly worth every cent, if only for the levity he brings to the subject — All hot air and feigned indignation. Whenever I see someone complaining about red thumbs I click on the red thumb. Some people are too sensitive. Stop complaining about people complaining about red thumbs ! My feelings are hurt now though, so I’ll have to go have a cry. I haven’t heard a better interview on Climate Change in a long time, will be sending this far and wide. 3:08 so I spent several years on the carbon gravy train, I got to see it from the inside and recognised that there’s a great deal of money and power at stake here and was being given it away. 3:38 I think like most people Emmet I assumed that what we were told was more or less right. I assumed that the climate scientists had got it right and yes carbon dioxide was in fact warming the planet dangerously and we did have to do something about it, so for a while there yes I thought I was a part of the project to save the planet from being burnt up. 9:17 It’s possible for the observations and the physics to both be correct, the thing that people have been overlooking is that there’s a possibility that there’s a mistake in the modelling, the way the physics is put together to create the climate models. 9:49 So it may well be that the physics of climate change is correct but the modelling is where the error is. 10:29 I should point out in the history of science Emmet there have been numerous cases where the theory has flagrantly disagreed with observation for years and years and nearly every time it worked out that the theory was wrong and the observations were correct. Science nearly always ends up agreeing with the empiricists. 11:20 If there was a mistake in the modelling made back in the 1960s that would account for the fact that the climate models don’t work. 12:54 If you triple the price of electricity from what it was say 10 years ago, solar panels and wind turbines start to become economic, kind of, although it will probably have to go up a fair bit more first. So one aspect of this theory that hits everyone is that the price of everything in the economy goes up, because our electricity costs three, five times as much as it did one or two decades ago and that’s a deliberate result of policy changes on the back of this theory. 44:49 But there are no new guys allowed into the system who disagree, so when the warmists say “all the climate scientists agree” they’re kind of correct in a way, but that’s because there is an institutional pressure, enormous institutional pressure to only hire people who agree with the theory. 52:04 Well Emmet I’m a modeller and this climate debate has all been about modelling and there’s a mistake in the models, we know that because the empirical evidence indicates that, so when I find the mistake I will publicise it shortly afterwards. 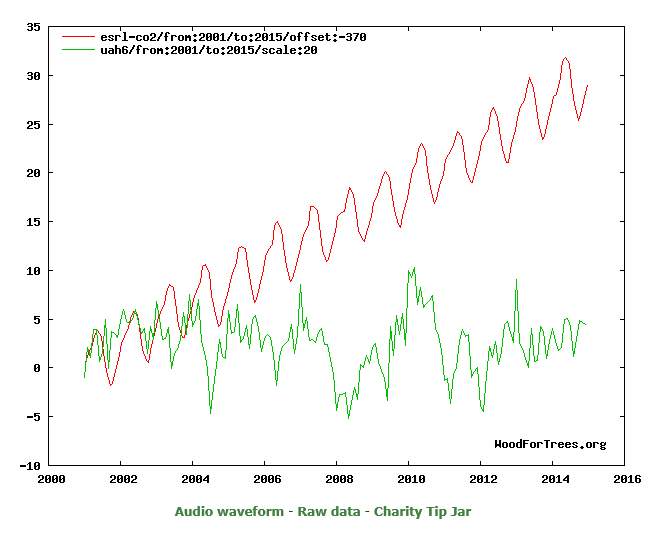 CO2 goes up, global mean temperature goes up. I threw in the solar for comparison. Using Wood for Trees is a bit rough, but it is probably good enough for this purpose. Actually the first one is a bit dodgy, this one is probably better. Hadcrut has already been exposed as having dodgy data . No it has not. Do not believe what some random fake expert tells you. If people start disputing peer-reviewed data, then we all might as well give up as it will be impossible to ever have a scientific discussion. If someone claims the data is affected by some errors (all data sets have a few), then the burden of proof is on them to show how much the data set results have been affected by the errors. But fake experts is ALL you have, twotter..
You are unable to produce any actual measured scientific evidence. Hadcrut has been shown to be full of bias, fabrication infilling and agenda driven adjustments. Early versions were reasonable, but then it just twisted and warped until V4 bears little relationship to reality. Actually, Hadcrut has not been peer-reviewed, ever. The paper showing just how BAD Hadcrut data really is, was peer-reviewed. Take another faceplant, twotter, straight into your own BS. I dispute most peer review data because it has a warm bias and the IPCC theory that CO2 causes global warming is simply wrong. Do not believe what some random fake expert tells you. But that, Harry, is why no-one here believes you. That’s actually good advice Harry, but then I’ve never believed most things you’ve told me. Here is the same correlation using Dr Roy Spencer’s satellite data. It’s a bit early to tell for sure, but it does look the the hiatus is well and truly over. Use those El Ninos for all your propaganda het twotter. And they are not caused by ANYTHING to do with humans or atmospheric CO2. I suspect you actually KNOW that to be the case. You certainly have no scientific evidence at all that atmospheric CO2 causes warming in our gravity controlled atmosphere. ZERO WARMING, broken only by the 1998 and 2015/16 El Ninos. And we all know that El Ninos cannot be caused by atmospheric CO2, don’t we, twotter. The hiatus won’t be over until 2020, a tipping point into the abyss. Harry correlation does not equal causation. Now where is that evidence of CO2 warming the atmosphere? It’s just a CO2 ability to substantially warm the atmosphere is just an unreal supposition if you can not supply verified observational evidence. I honestly cannot believe you are that ignorant of all the evidence. Go read the IPCC AR5 report for starters. What evidence? IPCC report is political propaganda subterfuge. It contains ZERO EVIDENCE of warming by atmospheric CO2. Why your continue HILARIOUS evasion … worming and squirming, twotter. ? Are you REALLY that EMPTY ????? Harry the IPCC is out of step with reality, serious global cooling should begin within a couple of years. If you’re interested I’ll tell you what is going to happen on the ground. Yes, it has its head in the clouds, then complains about how clouds are poorly understood. Clouds are like the moon: block sun, temperature drops. But why tell Harry? Why not let him meet the surprise face first? No I am not interesting in Astrology, I really am not. I leave the tin foil hats to people where the cap fits. Funny, AGW belongs in the same basket. EVIDENCE FEEE SUPPOSITION. Sorry the latest tin hat you brought was too small for your head. Harry, the fact is the IPCC’s climate models have not and still are not tracking the real world climate for the last 20+ years in terms of temperature, cyclones, hurricanes, etc.. If that’s your idea of evidence of CAGW then it makes our job of rebuking the report that much easier. You certain don’t seem to have any !! Look in the mirror, you will see that it is YOU that is grossly IGNORANT !! But where is your much stated evidence Harry. YOU, under the name of Harry Twinotter have shown none. NOTHING Harry. What’s up you can’t even quote the correct part of the IPCC report? Have you even read it? Someone like you Harry, I think not! So go ahead prove me wrong (but I know you can’t). You Harry Twinotter are a flimflam man as real as your made-up name. But you are good to laugh at! Yes, the SPM or the actual scientific reports, or any of them? You left out an “a”. Strange graph you manipulated there, Harry, it even makes the 20 year flat spot appear to be an enormous temperature increase. Feldman never actually mentioned temperature at all, just this tiny mysterious “forcing” that he spent 5 years extracting from the data. Then he MODELLED a regular forcing input. Destroyed his whole paper. Probably a good thing he didn’t look at the temperature, because that tiny 0.2w/m almost certainly was because of the partial El Nino. No partial length checks or anything. Not a good paper, could only have got through by PAL review, not a real scientific review. You are just data juggling. That was a reply to Harry who is trying to present distorted data. Ha ha ha I usually do not bother replying when a comment makes no sense, but I will make an exception in this case. How can you draw a conclusion from no data? No conclusion is better than a false conclusion from false data or incorrectly presented data that you were offering. El Ninos cannot be caused by human anything. Hadcrut is most definitely “dubious”. A fabricated compilation of AGW agenda biases and adjustments. You are unable to produce one bit of real scientific evidence that atmospheric CO2 cause warming, keep squirming little AGW apologist. 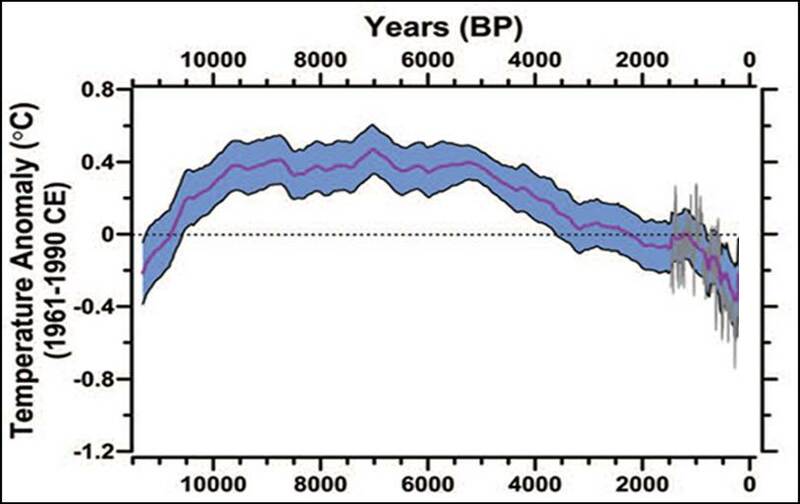 Then explain how for the last 10,000 years, temperatures have COOLED while CO2 went up. Oh dear Harry, still pushing that sad and very old correlation equals causation argument. I would have thought you would have learned a new meme by now and given up on that tired old junk. Really you’re like a scratched cd endlessly repeating the same tired out discordant and off beat phrase. This is what we don’t talk about and just about all we should be talking about. Seven+ billion of us are dancing on the head of that pin on the far left. Not for long. It’s nobody’s fault. When we started the whole complex civilisation gig just a few thousand years back we didn’t have geology etc to tell us the short time limits on warmth. Now we know, but it’s considered the height of rudeness to raise the subject. You could put herds of climate scientists and science communicators on fifty Airbuses, fly them to a climate conference the size of the MCG…and nobody would talk about the one thing that matters. Odd that. Thank you. You confirm for me what I’ve been saying for a long time — global warming is a political problem, not a science problem. Thank you for exposing NOAA as well and with them, their parent, NASA. By the way, your explanation is the most thorough and accurate description of the problem that I’ve seen. And I should add, the most honest, examining all the factors that I’ve come to recognize are involved and more, pro and con. I live in California and I’ve watched as the governor and the legislature have increasingly acted as if California can single handedly save the world from a non problem. I’m still looking forward to the polished notch theory that you’ve been working on. I might add that I hope my math background is good enough to understand the notch theory. I’ve done some work in the frequency domain and always bought algorithms suitable for the need. What you published on Jo’s site so far taxed me a little farther than I could go. Perhaps an explanation for dummies to go with it? I’m a modeller and this climate debate has all been about modelling and there’s a mistake in the models, we know that because the empirical evidence indicates that, so when I find the mistake I will publicise it shortly afterwards. We know that the original Equilibrium Climate Sensitivity to co2 doubling of somewhere between 2 degrees and 5 degrees was nothing more than a WAG. I suspect the error(s) lay somewhere within the enormously complex estimates of the feedbacks that determine the ECS guesstimates. But a close to zero or zero ECS to co2 is not useful to the money/political power driven agenda that carriers an enormous inertia at the point. They are “trained” to fake historic data. They have no choice but to make projections that are way too high an unrealistic. Regardless of if the physics in them is correct or not, until the models match the 1940s peak and 1970s dip in a reasonable manner, they are nothing but junk. Its a real Catch 22 situation for them. Either they fix the historic temperature data, which would destroy the AGW warming scam..
A negative climate sensitivity would destroy the whole scam and reverse the aims. By negative i do not mean cooling but opposing change. That is warming the minimums but cooling the maximums. It would show CO2 and other perhaps other GHGs to be the solution and not the problem. Perhaps by the time it is figured out many of the big CO2 sources and companies that needed cheap energy will have changed hands. The ONLY serviceable climate model is the graphical representation of Earth’s ice ages over the last half a million years and which are shown by Milankovic to be related to astronomy. Variations in tilt and wobble of Earth’s axis along with variations in distance from the Sun seem to provide the predictive power missing in the IPCCCCC s ridiculous climate models. That pretty much is true. Theres not much else to go on from the records that are fine enough. Of course interpretation is another thing, depending on ones side. Norm Page is back in action and supports the theory that we have reached a global cooling tipping point. I would say the lag is spread out over 12 – 25 years. A lot of energy entered the oceans during the series of solar maxima of the latter half of last century. There may still be another burp (small El Nino) before the cooling sets in. I think the whole Blog-post is pertinent here. Zharkova et al 2015 DOI:10.10381/srep15683 says ” Dynamo waves are found generated with close frequencies whose interaction leads to beating effects responsible for the grand cycles (350-400years) superimposed on a standard 22 year cycle. This approach opens a new era in investigation and confident prediction of solar activity on a millenium timescale. ” This is entirely consistent with my approach and forecasts. I would question, however, the statement in Benny’s Invitation ” The last super-grand minimum occurred during Maunder Minimum with magnetic field growing for 500 years(until ~2150) and decreasing for another 500 years.” I think the empirical temperature data is clear. The previous millennial cycle peak was at about 990. The recent temperature Millennial Turning Point was about 2003/4 which correlates with the solar millennial activity peak at 1991+/.The cycle is asymmetric with a 650 year +/- down-leg and a 350+/- year up-leg. The suns magnetic field will generally decline (modulated by other shorter term superimposed solar activity cycles) until about 2650.
it is useful to note the advice of Enrico Fermi who reportedly said “never make something more accurate than absolutely necessary”. My recent paper presented a simple heuristic approach to climate science which plausibly proposed that a Millennial Turning Point (MTP) and peak in solar activity was reached in 1991,that this turning point correlates with a temperature turning point in 2003/4, and that a general cooling trend will now follow until approximately 2650. The establishment’s dangerous global warming meme, the associated IPCC series of reports , the entire UNFCCC circus, the recent hysterical IPCC SR1.5 proposals and Nordhaus’ recent Nobel prize are founded on two basic errors in scientific judgement. First – the sample size is too small. Most IPCC model studies retrofit from the present back for 100 – 150 years when the currently most important climate controlling, largest amplitude solar activity cycles is millennial. This means that all climate model temperature outcomes are likely too hot and fall outside of the real future world. (See Kahneman -. Thinking Fast and Slow p118).Second – the models make the fundamental scientific error of forecasting straight ahead beyond the Millennial Turning Point(MTP) and peak in solar activity which was reached in 1991.Thisturning point correlates with a temperature turning point in2003/4. A general cooling trend will shortly follow until approximately 2650. Because of the thermal inertia of the oceans there is a varying lag between the solar activity MTP and the varying climate metrics. The temperature peak is about 2003/4 – lag is about 12years.The arctic sea ice volume minimum was in 2012 +/- lag = 21years. Possible sea level Millennial Turning Point – Oct 2015lag = 24 years +/- (see https://climate.nasa.gov/vital-signs/sea-level/) Since Oct 2015 sea level has risen at a rate of only 8.3cms/century. It will likely begin to fall within the next 4 or 5years. For the detail see data, discussion, and forecasts see Figs3,4,5,10,11,and 12 in the abstract and links below..
Valentina I think we are very close to agreement on all this. Any comments you might have would be much appreciated. At https://www.youtube.com/watch?v=_wB46mgJrzI , Professor Valentina Zharkova is the Special Guest, she speaks about GSM Global Cooling, solar observations, and how the nonsense of cAGW might cause considerable harm to many people through food/fuel shortages. Hosted by the website ‘Grand Solar Minimum Channel’ dated August 2017. Professor Valentina Zharkova offers a very sober and sane reading of some of the best solar science and possible future effect. I’m relying on this El Nino being modest and a strong 2019 El Nino based on Ian Wilson’s moon theory. The MSM is already talking about coral bleaching because of warm seas, which is a no brainer, but I can’t see it happening before 2019-20 when sea level should momentarily fall in the western Pacific and produce bleaching. Andy we should be able to take advantage of this knowledge. Just finished listening to David’s talk. Excellent. Clear and eloquent argument. But of course the politcal left are afraid of the slightest dissent and threaten all who dare to ask. Well done David for having the courage to speak up as you have done for many years now. first chance to see this thread. looking forward to listening to David today. I’ve just managed to listen. Excellent and very clear. NASA’s solar probe was launched in August and they are principally looking at solar winds or whatever else takes their fancy. A most enjoyable and illuminating interview – thanks! So what are those abbreviation? UCAR’s (University Corporation for Atmospheric Research under the sponsorship of the National Science Foundation – often written NCAR/UCAR) ) Large Ensemble Community Project has built a data base of “30 simulations with the ‘Community Earth System Model’ (CESM) at 1° latitude/longitude resolution. Each of the 30 simulations is subject to an identical scenario of historical radiative forcing but starts from a slightly different atmospheric state. Exactly what kind of “different atmospheric state”? and How different were the starting conditions? “The scientists modified the model’s starting conditions ever so slightly by adjusting the global atmospheric temperature by less than one-trillionth of one degree”. Constructed atmospheric circulation analogs are used to estimate the dynamical contribution to forced and internal components of SAT trends: thermodynamic contributions are obtained as a residual. Internal circulation trends are estimated to account for approximately one-third of the observed wintertime warming trend over North America and more than half locally over parts of Canada and the United States. Removing the effects of internal atmospheric circulation variability narrows the spread of SAT trends within the CESM ensemble and brings the observed trends closer to the model’s radiatively forced response. In addition, removing internal dynamics approximately doubles the signal-to-noise ratio of the simulated SAT trends and substantially advances the ‘‘time of emergence’’ of the forced component of SAT anomalies. 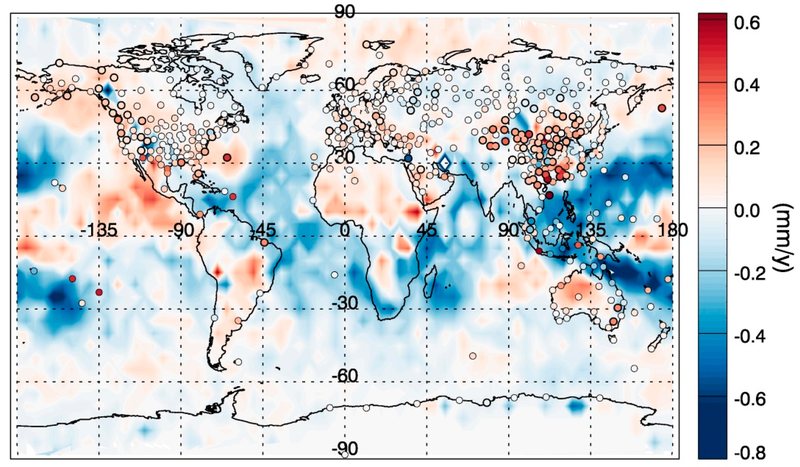 The methodological framework proposed here provides a general template for improving physical understanding and interpretation of observed and simulated climate trends worldwide and may help to reconcile the diversity of SAT trends across the models from phase 5 of the Coupled Model Intercomparison Project (CMIP5). And yes they were surprise to find that one-trillionth of one degree difference caused 30 different plots for the evolution of temperature across North America over 50 years. Maybe they should look-up who and why Edward Lorenz back in the 1960s knew this, and how it led to the field of study known today as Chaos Theory, the study of non-linear dynamical systems, particularly those that are highly sensitive to initial conditions. Essentially with dynamic but constrained systems (like the Earths temperature and climate) the so called noise has the chaos signal in it, and that signal is very difficult to differentiate from true system noise. Also to see that chaos signal correctly you’ll have to measure your temperature very, very accurately and precisely everywhere, as the smallest error through modeled projection off away from reality. Also to see that chaos signal correctly you’ll have to measure your temperature very, very accurately and precisely everywhere, as the smallest error through modeled projection off away from reality. Also to see that chaos signal correctly you’ll have to measure your temperature very, very accurately and precisely everywhere, as the smallest error throw modeled projection off away from reality. Since Prof Lindzen’s talk at the GWPF, I have been following the evidence trail. I had got to the Hadley Cell circulation and its equivalent Carnot engine. I understood that any Carnot engine must have a regulated energy supply and that the necessary supply must be variable. A PID(Proportional, Intergral, Differential) controller[1:] could provide the regulation. The control loop needs a desired set point. What provides the set point for the Hadley Cell circulation? It turns out to be the equatorial SST(Sea Surface Temperature) that triggers the formation of a thunderstorm. I had long known that tropical cyclones needed an SST of greater than about 26C in order to form. SST increases markedly during the day directly under the sun when no cloud is present and drops again overnight. It is just a question of when in the day the trigger SST temperature is reached. Beyond that please read Eschenbach. I found it thoroughly convincing. On the subject of David’s hunt for the elusive mistake in the GCM models, I would say, “Forget it.”. It hardly matters if a proper control loop is functioning with a well defined set point and spare power(more thunderstorms started earlier in the day) is available to cool SSTs at high temperature and dump the heat at the top of the troposphere. Eschenbach’s paper is dated 2010. My first instinct is that you’re thinking of this (imaginary) Carnot engine as having a finite size. The Hadley cell has more degrees of freedom than a normal Carnot engine. The Hadley Cell has a highly variable energy supply (it’s at least seasonal, but also there are incursions of remnants of both tropical and polar air-streams). To truly represent the Hadley Cell this engine has a variable size (the Hadley Cell varies a lot in size; seasonally and with the impacts of variations in the air mass about it. …) For unlike a Carnot engine the Hadley Cell can inflate/deflate to the size necessary to redistribute the energy dumped into it (and constrained by the pressures of the polar cell, tropical cell, and stratospheric air mass above it). This would translate to your model as a variable size Carnot engine with nominal set points that depends on the past conditions (how well past energy has been utilized) and current conditions. So overall the Hadley cell Carnot Engine varies it’s capacity (and therefor it’s ‘set point’) to deal with the incoming variable energy demand, and is constrained (your ‘control loop’) by the atmospheric cells to it’s North, South and the Stratosphere above it. The total extent of the Hadley Cells and Carnot engine is from about latitudes 30N to 30S. The two Hadley cells, north and south of the equator, each have very large annual power changes but the figures and satellite photos I have seen do not show a size change of any significance for each cell. The total power of both cells is far more even through the year. Satellite pictures of evaporation reflect the power changes. The work in the Carnot Cycle is produced in the central ITCZ thunderstorms and this single engine serves both cells, so its power remains relatively constant over all seasons. The diagrams in the reference can be expanded for more detail. To be clear, the ‘set point’ is the SST prior to the initiation of a thunderstorm at about 26C or over. The Carnot engine cannot change that directly. What the Carnot engine can do afterwards is lower the SST by evaporation of warm surface water beneath it. Radiation overnight under clear skies can lower the SST more, so that that by dawn the warming can begin again until another thunderstorm is initiated. The Hadley cell in the Northern Hemisphere, not surprisingly, reaches its peak power of 218 TW in January with a minimum of 0.5 TW in July. The counterpart in the Southern Hemisphere has a peak of 204 TW in August with a minimum of 32 TW in January. The Hadley cells are NOT static they are approximations! They vary quite a bit. <– Observations! The air here is NOT and ideal gas, far from it! <–Observations! Stop thinking of this flawed idealize version as it does not by any stretch of imagination relate to reality. And so far our Mr. Twinotter has never listed or even hinted at his degrees or qualifications even though I invited him to. I’ve given mine several times. BS and MS in Computer Science and those are from an obscure university dedicated to the needs of working adults. And I don’t pretend to know more than I actually know. And I can’t hold a candle to most of you who are engineers or scientists. He commented on this thread as though he knew what’s what and then went back into hiding — at least unless someone knows of a subsequent comment I missed. I wonder what that tells us about Harry Twinotter. Come on Harry, let us know who you really are. Roy if you are claiming any expertise in climate science I am willing to accept that, as long as you cite your publications in the peer-reviewed scientific literature. I never claimed any expertise or qualifications in climate science so you are misrepresenting me – go look up “straw man” in Wikipedia. What I can do is understand the state of the science, there are plenty of good references and guides around. It all comes down to the scientific evidence. I am always astounded people like yourself can just dismiss the conclusions from the majority of climate scientists – what is your justification for believing the word of a small number of fringe scientists against the majority? You have really got to just step back and consider if your beliefs are justified. So still you have no degrees to back you up, no known math or physics background or any other qualifications that will let you claim that you understand, “…the state of science…” and yet you make that claim. You have exposed yourself as ignorant about the state of science, the state of your knowledge of science and about climate change. Why, Harry, if you understand what you say you understand, do you not understand that the Earth is not a black body and that a black body doesn’t even exist in reality? If you understand what you say you do why do you think peer review is worth anything? It’s not. And why would you think I’m making any claim to be a climate scientist? And I don’t dismiss anything. I ask for evidence as any good scientist would. I have yet to see evidence. An that’s why I’m what you would call a denier. You should ask for evidence to but instead you just swallow the fallacy that a consensus must be right. All you are, Harry, is ignorant and foolish. Parroting propaganda AGW garbage is NOT as sign of expertise, twotter. You have been asked to PRODUCE THE EVIDENCE many times, but you remain totally DEVOID of anything resembling science to back any of your mindless rantings. Look in a mirror when you say that, twotter. Just BE-LeeeeeeVE, twotter.. its all you have. His ability to articulate is obviously produced by having a special wife. Dr. Evans should speak and write more. He has much to teach. Yet you can’t claim even 1/10 of his qualifications. If you could I think someone with your ego wold list them all. Poor twotter,, there’s that jealously coming out again. David has about 10 magnitudes more education than YOU will ever have. You are a mental gnat compared to him.